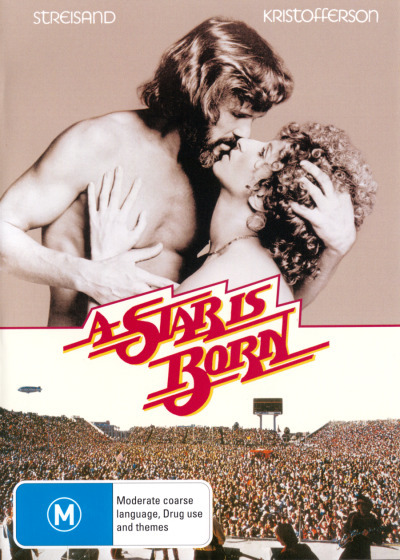 A Star is Born DVD is the 1976 classic starring Barbra Streisand and Kris Kristofferson. Talented rock star John Norman Howard (Kris Kristofferson) has seen his career begin to decline. Too many years of concerts and managers and life on the road have made him cynical and the monotony has taken its toll. Then he meets the innocent, pure and very talented singer Esther Hoffman (Barbra Streisand). As one of his songs in the movie says "I'm gonna take you girl, I'm gonna show you how." And he does. He shows Esther the way to stardom while forsaking his own career. As they fall in love, her success only makes his decline even more apparent. A love story for the time - and a great film it is. The fire of Barbra Streisand. The magnetism of Kris Kristofferson. The reckless world of big-time rock n roll. All three bring a new passion and timeliness to A Star is Born, one of the screens classic love stories (previously filmed in 1937 and 1954) and winner of five Golden Globe Awards, including Best Picture, Actress and Actor (Musical/Comedy). Paul Williams, Kenny Loggins, Leon Russell and others worked with Streisand on one of the most popular songs scores ever, topped by the Streisand/Williams Evergreen winning the Academy Award and golden Globe Award as 1976s Best Original Song. Their teamwork resulted in a box-office triumph as well as a considerable achievement (Clive Hirschhorn, The Hollywood Musical). I was just 16 when I first saw this love movie - it has been in my heart eversince!! 30 years on. Haven't seen it since then and would love to see it again. Hoping I will love as much now, being much older!! Click the button below to add the A STAR IS BORN (1976 BARBRA STREISAND) to your wish list.